If Kubrick had stopped making movies after 2001: A Space Odyssey, the world would be the poorer for it. Bill Watterson, creator of Calvin and Hobbes, walked away from the comics page at the end of 1995 and has rarely been heard from since. Watterson’s continued absence from the comics page is felt as sharply as ever, which is partly why this blogger anticipated the first full-length treatment on the man and his masterpiece. 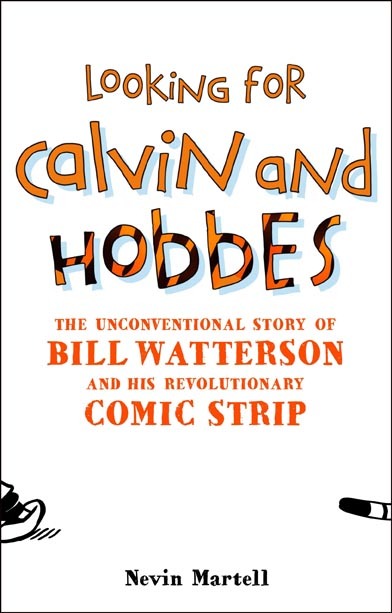 As a cartoonist who has written his fair share of words about comic strip legend Bill Watterson, I was keen to read Nevin Martell’s part-biography, part-homage Looking for Calvin and Hobbes. Fortunately not all unauthorized biographies strive to be muckraking, and this is one. Martell is fan first, investigative journalist second. In his quest to answer a few questions about the reclusive cartoonist, Martell had to strike a balance between wanting to know more about Watterson and not wanting to intrude upon his self-imposed privacy. Some cynics would question how you can honor your subject’s privacy while writing a book about said subject. I don’t know if Martell answers that question, but it is clear that he clearly has a lot of respect for the man who created one of the great comic strips. I gleefully skipped across the same line by reading his book. I did it out of interest for someone who I consider one of my best teachers and certainly one of my heroes. 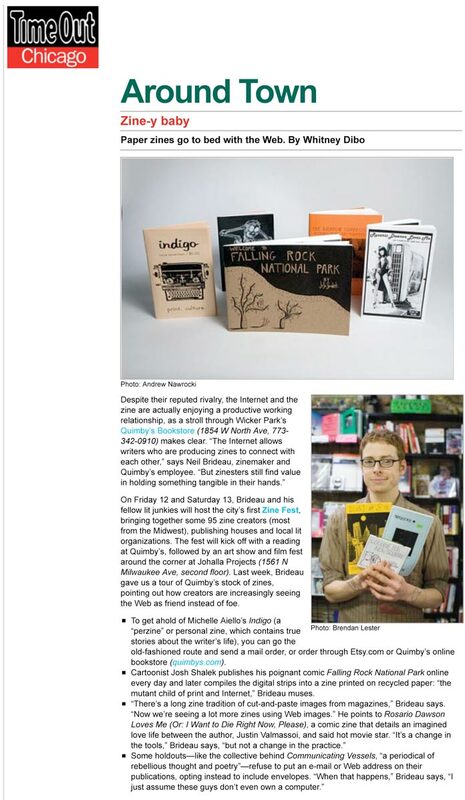 Don’t misconstrue my criticisms as a dislike for the book. I’ve found that, when you truly appreciate something, you find a thousand more nitpicky things than if you are uninterested in it. I’ve spend so much of my life reading and thinking about Calvin and Hobbes that I’ve come to a few conclusions of my own, and it was honestly a bit jarring to read that Martell’s take could be quite different. That is, of course, one of the great things about Calvin and Hobbes – everybody has their own understanding of it. 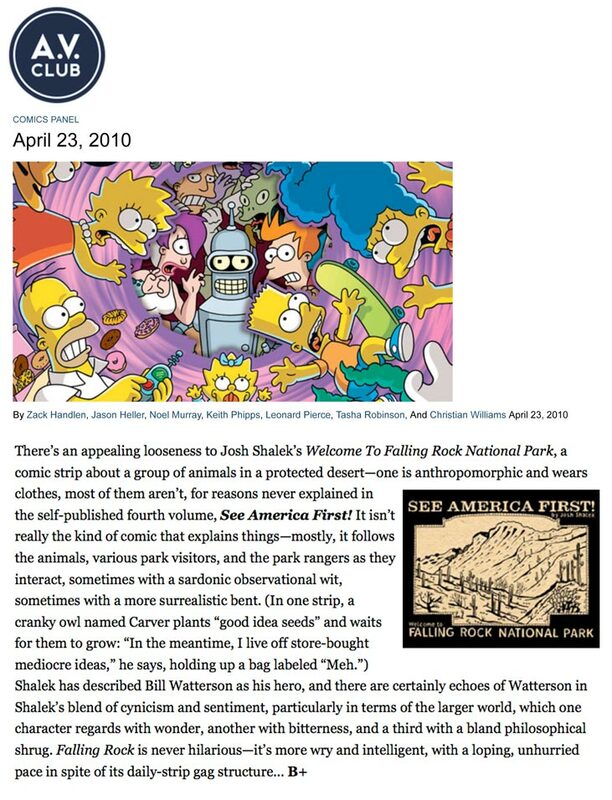 Maybe this is why Watterson railed against merchandising, marketing, and inquiries into his personal life: he wanted, more than anything else, to create a strip that would speak directly to each reader, without outside commentary influencing that dialog. When Calvin speaks, he speaks in my voice. When Hobbes pounces, he does it in exactly the way I imagine it. A book like Martell’s only seeks to honor Watterson and his work, but simply by existing it provides what some may mistake as an authoritative voice interrupting our own personal communication with a boy and his tiger. Watterson’s stand against licensing is part of what made him a hero when I was a kid. How many public figures stick to their principles when fame and fortune are thrust upon them? It certainly turned him into a contentious character around his syndicate, and I count myself one of the kids saddened that I couldn’t have a Hobbes doll of my own. But Watterson took his responsibility as a storyteller seriously. He didn’t want our perceptions of him to get in the way of his work. He also didn’t want to become a businessman, which I can understand completely. We become cartoonists because we want to get out of an office, not become manager of our own. 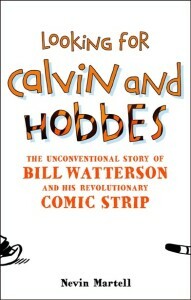 An especially funny anecdote in Looking for Calvin and Hobbes relates the story of Watterson, then living in New Mexico, receiving a box full of Hobbes plush dolls from a hopeful manufacturer. His reaction? Marching them to his yard and burning them all. How awful to be a kid walking by Watterson’s house at that moment? A moustachioed man burning Hobbes in his yard. I can’t imagine a more horrifying image. Sometimes we have to be the villain in order to do the right thing. The one piece of information I hoped to gather from this book was Watterson’s working method. Who would turn down the chance to watch Van Gogh paint Starry Night? Or to sit in the studio when John Lennon went through take after take of Strawberry Fields Forever? That, more than childhood trivia, should be this book’s reason for being. There were a few clues as to how Watterson worked, but unfortunately they were few and far between. Martell focuses on the facts he can find, and since he was not able to talk to Watterson directly, he was forced to rely on friends, cartoonist acquaintances, and old interviews (most of which I have already read). Martell also made a trip to the Cartoon Library & Museum in Columbus, Ohio, to look at Watterson’s original drawings. I’ve made this pilgrimage myself, and I cannot recommend the library enough – it is literally the closest you can get to the work. But I didn’t need to read Martell’s take on the strips; his insights leaned towards personal rather than artistic detail. When museums x-ray a painting by Da Vinci, they do it because Da Vinci himself is not around to explain how he made it. 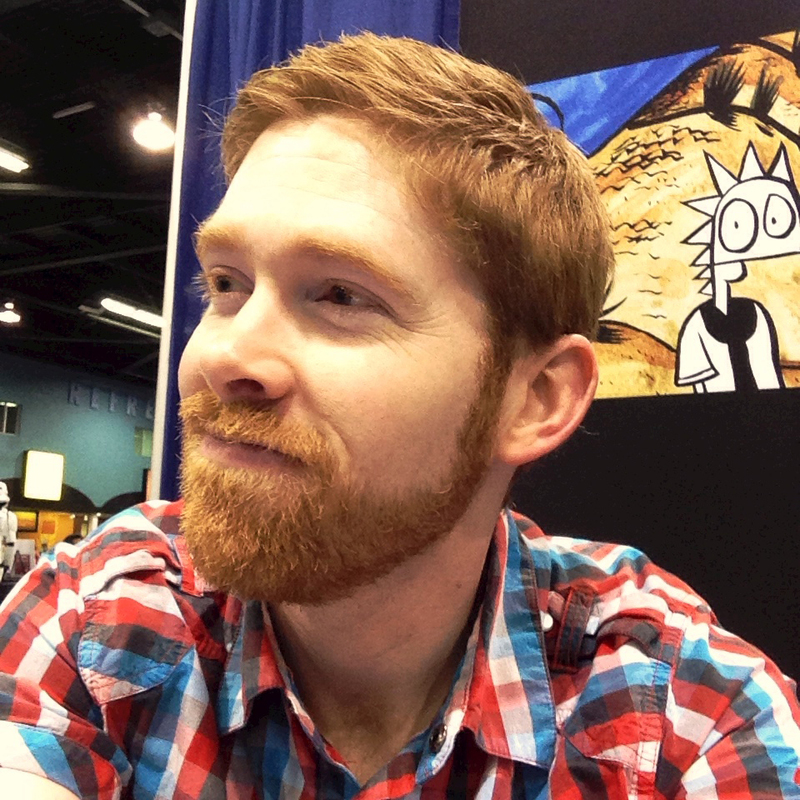 Watterson still is around, yet he isn’t interested in imparting wisdom to the next generation of cartoonists. This is a great tragedy. Even when you look at an original Calvin and Hobbes you’re only seeing the finished product, not the process. His few, light pencil marks only tell so much. And of course we can only speculate about how he wrote. This especially applies to the later Sunday strips. How did Watterson decide where to put the panels? How to size them? It would be amazing to see a strip from beginning to end, from dialog written in a lined notebook to pencil sketches of layout to the inked final page. The interviews Martell undertakes represent a fairly wide circle around Watterson. From cartoonists such as Richard Thompson, Stephan Pastis, Keith Knight, and Bill Amend, to Watterson’s editor Lee Salem, to Watterson’s mom and a couple of his personal friends, to people who are mainly referenced as “color commentary.” It’s cool to hear from Brad Bird, but he doesn’t really tell us much we don’t already know about Calvin and Hobbes. Martell also annoyingly interprets Watterson’s few interviews as standoffish and cantankerous. Martell sees conflict and strife where I see a man attempting to fully grasp the unusual situation in which he’s found himself. I doubt many of us could explain our lives with as much eloquence and insight as Watterson has done. If he sometimes came off as overly judgmental of his cartooning peers, it was only because he held himself to the same exacting standards. Surprisingly, Martell doesn’t know much about comics. He is a reader, not a cartoonist. 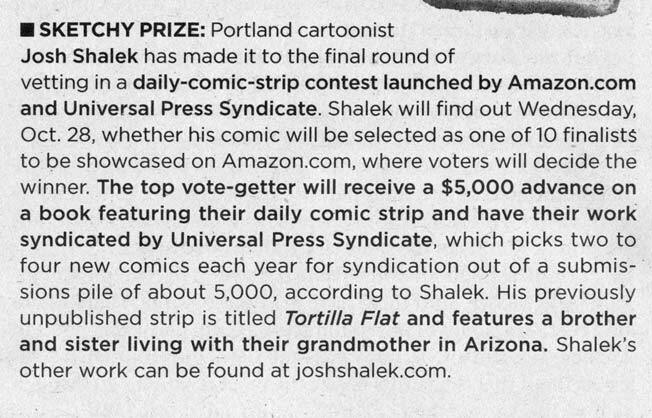 The book would have been helped by someone who knew the comics landscape into which Calvin and Hobbes dropped and how it affected the comics page even 14 years after its retirement. How can you talk about the significance of Calvin and Hobbes if you have just recently become acquainted with Krazy Kat and Pogo, not to mention newer strips such as Cul de Sac, Lio, and Pearls Before Swine? Martell comes off as a competent journalist but a lackluster art critic. Another funny anecdote. When Universal Press Syndicate announced Calvin and Hobbes would be running as a half-page feature upon Watterson’s return from sabbatical, the reaction from newspapers was fierce. Yet, of the 1800 papers that ran the strip, only 7 dropped it. It kind of makes me wonder what syndicates could get away with if they made similar demands for popular strips today. Although it wasn’t the main reason for reading the book, I was pleasantly surprised at what Martell uncovered about Watterson’s formative years. He mentions the editorial strips Watterson did while working in Columbus for six months, but he also finds college comics, editorials done for other papers, and a strip he did for his hometown paper when he was in high school. Maddeningly, none of these are reproduced in the book. I’m not sure whether this was Martell’s decision or the publisher’s, but that absence keeps this book from being essential. Studying the early work of a great artist is always helpful. How did Watterson arrive at Calvin and Hobbes? I’m grateful for the digging Martell did, but mere descriptions fail to do justice to Watterson’s comics. Looking for Calvin and Hobbes (in Martell’s case, writing, and in my case, reading) is a way to deal with the loss of a beloved comic strip. But it isn’t Calvin and Hobbes I miss as much as Watterson the cartoonist. If he were to return with a 500-page sci-fi graphic novel, or, heck, a DVD player instruction manual, I would be pleased beyond words. Watterson showed us how it is done. His comics are invaluable as entertainment, social commentary, and as a signpost showing us how good the art form can get.